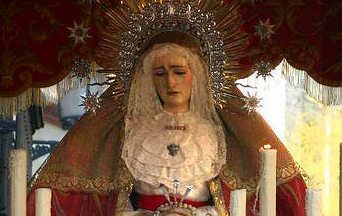 September 15 is the Feast of Our Lady of Sorrows. About this day, Abbot Prosper Guéranger comments how Our Lady, whom God predestined to be the Mother of His Son, was united in her person to the life, mysteries and suffering of Jesus, so that she might be a faithful cooperator in the work of Redemption. He notes that God must consider suffering to be a great good since He gave so much suffering to His Son, Whom He loved so much. And since, after His Son, God loved the Holy Virgin more than any other creature, He also wanted to give her suffering as the richest of all presents. 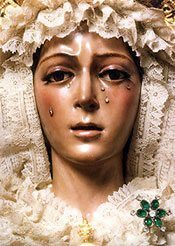 In the solemnity of this feast, we principally remember Mary on Calvary where she suffered the supreme sorrow of all sorrows that filled her life. Indeed, so great was Mary’s grief on Calvary that, had it been divided among all creatures capable of suffering, it would have caused them all to die instantly. If the Church limits the number of sorrows to seven, it is because this number has always symbolized the idea of totality and universality. To understand the extent and suffering of Our Lady, one must know the extent of her love for Jesus. Her love as Mother of God only augmented her suffering. In fact, nature and grace came together to produce profound impressions on the heart of Mary. Nothing is stronger and more pressing than the love that nature gives a mother for her son or that grace gives for God. These considerations help us understand the role of suffering in our lives. We see we are not alone in our suffering. In fact, the immensity of the crosses suffered by Our Lady was so great that we might also say she suffered not seven, but all sorrows. She is Our Lady of All Sorrows since no one suffered more. The American TFP’s national headquarters, in Spring Grove, Pennsylvania. Thus, we need to understand better that when sorrow enters our lives, it is a proof of God’s love. And when we are not visited with sorrow, we do not have all the proofs of God’s love for us. It is in sorrow that our mettle is tested. Moreover, one finds a note of maturity, stability and rationality in those who suffer and who suffer much. And so we should understand that when adversity, difficulties, misunderstandings, bad health and conflicts visit us, we must not see them as things that should never happen. To suffer is normal in this vale of tears. If she, whom God loves so much, suffered, how much more should we suffer. He, who God and Our Lady love, suffers because God will not refuse to give him that which He gave abundantly to the two whom He loved most: Our Lord Jesus Christ and Our Lady. Thus, we must see temptations, trials, stress and so many other sufferings as something normal in life. We must ask that sufferings pass but when they persist, we must bless God and Our Lady. Here are seven graces the Blessed Virgin Mary grants to souls who honor Her daily by saying seven Hail Marys and meditating on Her tears and Dolors. The devotion was passed to us by Saint Bridget. 7. I have obtained (this grace) from my Divine Son, that those who propagate this devotion to my tears and sorrows, will be taken directly from this earthly life to eternal happiness since all their sins will be forgiven and my Son will be their eternal consolation and joy. 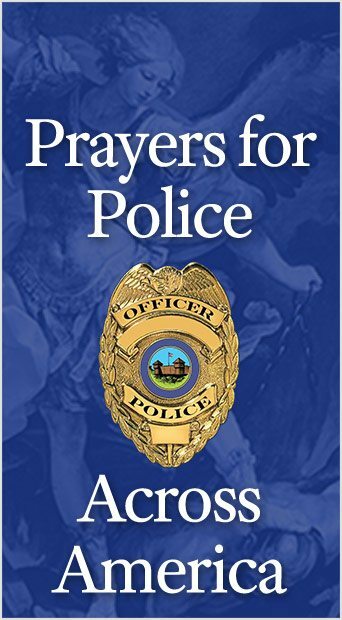 This entry was posted in About Our Lady and tagged Abbot, Adorable, adversity, America, Blessed, body, Bridget, burial, Calvary, Catholic, Christ, Church, conflict, consolation, creature, Cross, Crucifixion, death, devotion, difficulties, Divine, Dolors, Egypt, eternal, Family, forgiven, God, grief, health, Heart, holy, infernal, Jesus, life, Mary, maturity, misunderstandings, Mother, mysteries, Novena Prayer, Our Lady, pains, proof, Property, Prosper Gueranger, rationality, Saint, sanctification, Seven, Simeon, society, Son, Sorrows, souls, stability, suffering, temple, TFP, Tradition, valley of tears, Virgin, Way by TFP.org. Bookmark the permalink.